There is, indeed, something to these charges. Neoliberal regimes like Harper’s have been strengthening their military and security apparatuses. They have been deploying their international economic policy to undergird the internationalization of capital. But the view of a pre-Harper internationalist and just Canada spins illusions about Canada’s past. Canada has been long time engaged as an ally of British and American imperialism (going back to the era of the Atlantic slave trade triangle). More tellingly: it fails to situate Canada properly as an imperialist state in its own right advancing and protecting the international interests of Canadian and Western capital. 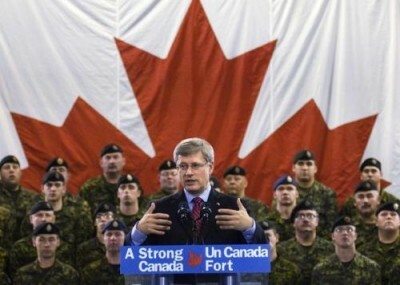 The Harper regime did not invent Canadian imperialism. It has long been a central feature of the governance and organization of Canada’s foreign policy. It is necessary to avert misplaced hopes that a Liberal or NDP government might usher in a new era of cosmopolitan enlightenment in Canada. The Harper government administers a core capitalist state, with particular imperial interests, secured and cultivated through its foreign policy and international branches. Imperialism cannot be dispensed with by a simple shift in foreign policy. Capitalism is a social system with an essential contradiction between the locally specific production and appropriation of value, the global accumulation of capital and the territorially based states. These states simultaneously protect domestic investments and facilitate the internationalization of capital in the world market. The inter-state system forms into a hierarchy of dominant core states and peripheral zones in an imperialist chain. Hegemonic states like the U.S., and international institutions like the World Bank, the IMF, NATO and the UN Security Council, politically enforce and manage the inequalities of the world market. As the global accumulation of capital increases in its extent and complexity, foreign policy, as well as the defence and security apparatuses of the state, becomes ever more drawn into defending economic interests as geo-political imperatives. This forms an ‘uneven interdependence’ between states: competitive rivals over markets but cooperative allies in sustaining global capitalism. Political projects for alternate world orders, whether socialist or nationalist giving priority to democratic and territorial sovereignty, have to be confronted and subordinated. Canada has played a critical role in modern imperialism. It has done so as a ‘secondary imperialist power,’ allied with the dominant empires of the UK and now the U.S., while protecting its own economic interests. It has done so through a foreign policy strategy of ‘cooperative specialization.’ Canada cooperates closely with the lead imperialist power. Over the Cold War period, this meant specializing in diplomacy, peace-keeping and soft power. But in the period of neoliberalism, this has meant specializing in diplomatic coverage for foreign intervention, advancing free trade agreements and the hard power of ‘disciplinary militarism’ of foreign combat missions. Like the other core capitalist states, the Liberal government of Jean Chretien reorganized Canada’s military and foreign policy apparatuses after September 11, 2001. The new geo-political context established by the U.S. under the Bush Doctrine radically affirmed American primacy in international relations and its willingness and capacity to act unilaterally outside of international legal restraints. President Obama has never repudiated the approach established by the ‘war on terror.’ He makes constant referral to the U.S. as the ‘indispensible nation’ and, for another example, continually deploys drone attacks outside any international framework. This is a strategy of ‘disciplinary militarism’: the use of armed force to compel states, if their domestic capitalist classes and political elites are not already doing so, to adhere to the neoliberal world order under U.S. hegemony. The U.S. state under Bush-Obama has pursued, moreover, international policies for free trade, capital mobility, the re-capitalization of the banking system, and the re-building of international derivatives markets as the framework for exit to the economic crisis. These policies can be labelled the ‘new imperialism’ for their particular military, diplomatic and economic shaping world order. Several features stand out. First, over the last decade the Canadian state has been re-designed to extend its security capacities. This is, in part, comprised of: establishing a new set of security doctrines; forming a Ministry of Public Safety and a new Cabinet Committee on security matters; an extensive re-haul of all the branches of the Canadian state to enhance the priority of security and protecting the interests of Canadian capital internationally; and developing new doctrines and operational procedures for Arctic security. Second, from the International Policy Statement and the Security and Prosperity Partnership of 2005, the Canadian state has systematically aligned its institutions and practices in border security and economic concerns with the USA. This has been part of building a Fortress North America. It includes: increased coordination of policing and security; transforming border and airport administration into a more common set of policies, including the ‘smart borders’ initiative; increased inter-departmental coordination in all areas of international overlap; and closer alignment with the U.S. on the diplomatic front, especially with respect to the Middle East and Latin America. Third, the Canadian military has transformed its military capabilities away from peace-keeping toward flexibility for overseas deployment. This has meant: re-writing Canada’s military doctrines; building operational capabilities for overseas deployment including ‘networked joint capabilities’ for ‘multi-force, multi-country’ actions; overhauling military hardware; renovating the training of troops for overseas combat, particularly urban guerilla wars; and improved functionality to operate in support of U.S. military operations. Fourth, both the foreign and economic policy branches of the state have been restructured to give priority to the internationalization of capital. This is for foreign direct investment circulating into Canada and especially for Canadian capital expanding internationally, such as mining and financial capitals. This has involved: bolstering international institutions like the WTO, the IMF and the G20; opposing international regulation constraining finance; expanding the exploitation of Canadian raw materials in Northern Canada for export; and seeking out free trade agreements, following the NAFTA framework, in Asia, Latin America and Europe. Since first coming to power in a minority government in February 2006, Harper had mainly to steer aggressively down the path laid out by the Liberals (and accommodated by the NDP). He has methodically done so. Harper has seized whatever openings events provided to harden Canada’s foreign policy. This meant marginalizing Canada’s prior mediating role between imperialist powers of the peace-keeping period, and adopting a more aggressive posture. It is not possible to catalogue all the foreign policy shifts, small or even large, that have transpired. But listing some key elements illustrates the Canadian state’s belligerent imperialist role under the Harper regime. A significant upgrading of Latin American issues in DFAIT and CIDA to pursue bilateral trading agreements and the internationalization of Canadian capital, particularly in the mining sector. Under Harper, FTAs signed with Colombia, Honduras, Panama and Peru. FTAs also signed under Harper with Jordan, Madagascar and the European Free Trade Area, and ongoing negotiations moving toward agreement with China (Foreign Investment Promotion and Protection – FIPA), India, Korea, the EU (Comprehensive Economic and Trade Agreement – CETA), and others. Increased coordination and integration of the auto sector with the U.S. through the 2009 auto bailouts; cooperation with the U.S. in attempting to develop the Keystone pipeline project from the Tar Sands to the U.S.; and increased coordination with the U.S. over energy supplies. In 2011, Canada participated in the military intervention in Libya, while supporting Mubarak in Egypt to the end and the reactionary Arab gulf states. This has extended to providing military training to the Saudis, while deploying war ships to assist in the isolation of Iran. The imperialist agenda of the Harper regime has widened the gulf between foreign and economic policy objectives of the Canadian state and the vision of a more democratic and just world order of the Canadian people. The Canadian capitalist class and political elites have been on one side of this divide; and the union and social movements on the other. These movements are diverse in their origins – Palestine solidarity, anti-war campaigners, climate change activists, anti-globalization militants, and others. Greg Albo is co-editor of Empire’s Ally: Canada and the War in Afghanistan . He is an associate professor in the Department of Political Science at York University.